The most important events in yesterday’s 16th meeting of the year were four semi-final races from the Krafft Championship for Silver Class trotters on a short distance of 2,140 metres. The programme consisted of 11 races, including one for flat horses. Driver Noel Baldacchino had a memorable afternoon after securing three wins. From the four Silver Class semi-finals, 12 horses booked a berth in the championship final. In the first semi, Memory Chip (Julian Farrugia) was unchallenged throughout, passing the finishing post first easily by a length-and-a-half from Sitka Rod (Tony Demanuele) and Beckham Bob (Charles Camilleri). These two trotters also made it through to the final. Favourite Global Offspring (Noel Baldacchino) finished fourth. For Memory Chip, this was its first win of the year. The second semi-final was characterised by a keen tussle involving four trotters in the final straight. It was favourite Razor Shadow, under the guidance of Nathaniel Barbara, which secured its third win in a row from Turbot De Renier (Ivan Bilocca), Ramses De Tyrole (Anton Cassar) and Showtime (Noel Baldacchino). As expected, Danish mare Speedaway (Charles Camilleri) notched its third consecutive win in the third Silver Class semi-final. Speedaway stormed clear midway through the home straight, finishing ahead of Indeed Southwind (Kevin Sciberras), Sirocco Kadesh (Noel Baldacchino) and Orage Du Pont (Julian Farrugia). In the fourth and last semi-final, there was a close finish between Prince Lu (Shaun Portelli) and Sorcier d’Orient (Kurt Saliba). The two sprinted neck-and-neck midway through the final straight but Sorcier d’Orient was declared winner after that the photo-finish had been consulted by the racing stewards. Holy Smoke (James Briffa) was the last trotter to secure a place in the final stage. Royal Apanage (Redent Magro) followed in fourth. The first event on the card was a flat race on a short distance of 1,250m. Six horses took part in this race with Dasho (George Falzon) leading all the way and winning easily by two lengths-and-a-half from Timolin (Michael Sultana) and Gold As Good (Demis Zammit). Baldacchino completed a treble of wins after prevailing in two Gold races with Sensei and Soprano Du Lys and a Bronze event with Grace Party. Race 1: Flat, Dasho (George Falzon). 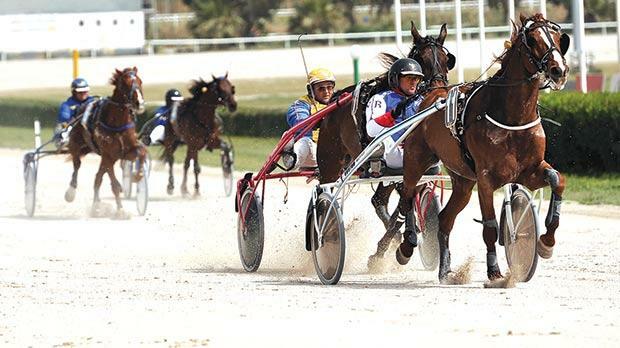 Race 2: Copper, Quibus (Jason Cordina) – 1.18.3”. Race 3: Bronze, Grace Party (Noel Baldacchino) – 1.17.3”. Race 4: Silver, Very Nice Seven (Charles Camilleri) – 1.14.9”. Race 5: Gold, Soprano Du Lys (Noel Baldacchino) – 1.15.7”. Race 6: Krafft Championship SF (silver), Memory Chip (Julian Farrugia) – 1.15.5”. Race 7: Gold, Time Square (Michael Ellul) – 1.15.6”. Race 8: Krafft Championship SF (silver), Razor Shadow (Nathaniel Barbara) – 1.15.7”. Race 9: Krafft Championship SF (silver), Speedaway (Charles Camilleri) – 1.16.6”. Race 10: Gold, Sensei (Noel Baldacchino) – 1.14.8”. Race 11: Krafft Championship SF (silver), Sorcier d’Orient (Kurt Saliba) – 1.16.8”.